The India-Pakistan Foreign Ministers meeting in New Delhi ended without much hype. While External Affairs Minister, SM Krishna said that the talks had been “useful” and on the right track, his young Pakistani counterpart, was more upbeat about the bilateral dialogue process. And described her talks as the call for a “new era” of amity. 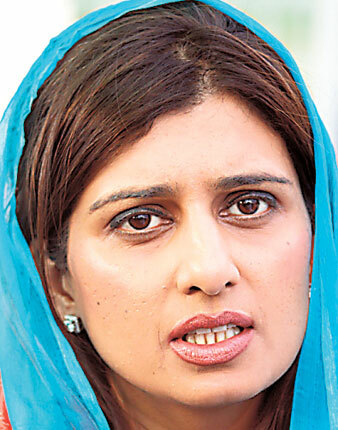 Ms Khar, who was recently elevated to the status of Cabinet Minister in the Foreign Office, lauded the “spirit in which we have been able to sustain the dialogue and, will hopefully take it through the next round.” Pakistan, she said, is committed to the dialogue process. “It is our desire to make it an uninterrupted and uninterruptible process,” she said. She believed that it was in both countries “national interest to have good neighbourly relations” with each other. Both sides should work to make the bilateral dialogue process to make it “a truly people centric process.” She expressed the hope that “a new generation in India and Pakistan will see a relationship which is going to be much different then the one we experienced in the last few decades”. Krishna, on the other hand, was more sober when he expressed his satisfaction “at the progress achieved in this round of the resumed dialogue.” Both sides had reaffirmed their commitment to resolve all outstanding issues through a comprehensive, serious and sustained dialogue. “While being fully cognisant of the challenges that lie ahead, I can confidently say that our relations are on the right track”, he said. The new Pakistani Minister’s optimistic, even fulsome remarks are unusual for a visiting Pakistani minister. They are in sharp contrast to her predecessor, Shah Mahmood Qureshi who had got in a public disagreement with Minister Krishna at the last Foreign Ministers meeting in Islamabad in July last year. Ms Khar said that she saw a “changed mindset” among the peoples of the two countries for a “friendly, cooperative relationship” between them. India-Pakistan relations are not run by their respective Foreign Offices; they require a much wider consultation base in each country, while in Islamabad the Pakistani army leadership has a premier role in formulating the India policy. In this past year since Shah Mahmood Qureshi almost derailed the dialogue process with his grandstanding at the joint press conference last year, there has been a change in outlook of the Pakistani military leadership. Pressed into a tight corner by its deteriorating relationship with Washington in the past three months after the killing of al Qaeda chief, Osama bin Laden, neither the Pakistani government nor its army chief, Gen Pervez Kayani would favour a hawkish stance on the dialogue process with India. Pakistan is also beset with its own internal problems with Jihadi terrorism. An unnecessary controversy with India at this time would only add to the current difficulties with Washington which wants Islamabad to give its attention to the war against terror and not be diverted by an India-Pakistan disagreement. Pressed into a tight corner by its deteriorating relationship with Washington in the past three months after the killing of al Qaeda chief, Osama bin Laden, neither the Pakistani government nor its army chief, Gen Pervez Kayani would favour a hawkish stance on the dialogue process with India. The stage had been thus set for a successful meeting and the Foreign Ministers talks covered all the outstanding issues in the India-Pakistan bilateral relationship, including the Mumbai attacks. They cleared up the air and “put the relations on the right track,” as the External Affairs Minister put it. The Indian media was bowled over by the remarkably poised and articulate, Ms Khar’s personable appearance, which was a combination of western designer wear and Pakistani chic, but took umbrage at her meeting the separatist leaders of the All Parties Hurriyat Conference shortly after she reached New Delhi. She also had a meeting with JKLF leader Yasin Malik in Lahore just before her trip to Delhi where she spoke about tripartite talks with “genuine Kashmiri leaders”. The meeting was attended by Pakistan’s Foreign Secretary Salman Bashir. Visiting Pakistani ministers have often met the Hurriyat leaders but have rarely committed the indiscretion of doing so before meeting their hosts and holding official talks. And the Indian side conveyed its displeasure “in a free and frank manner.” But both sides emphasized in their joint statement that the Ministers had discussed the issue of Jammu and Kashmir and agreed to the need for continued discussion in a purposeful and forward-looking manner. However, the confidence building measures (CBMs) agreed to – the usual methodology to rate the success of India-Pakistan talks – were quite modest. There was some smoothening of the hassles that cross-Line of Control (LoC) travel and trade usually entail. Traders would be allowed multiple entry permits that are valid for six months, the telecommunications system would be enhanced, the number of days and hours on which trucks can cross the LoC would be increased. They also agreed to expand the cross-LoC travel to allow for tourism and religious pilgrimage. But an important demand of traders that would greatly increase the quantum of cross-LoC trade – establishing banking facilities – did not figure in the CBMs. Trade across the LoC is through barter, which poses problems for traders of finding adequate products since there is a specific list on 21 items that can be traded. Kashmiri traders have been arguing that the volume of trade would increase if payments can be made for the goods instead of restricting the trade to barter. They have also asked for an expansion of the list of tradable items since there is a good market for Indian goods across the LoC. Two other agreements were on reviving the India-Pakistan Joint Commission after more than two decades, with technical working groups to identify avenues of cooperation. They also agreed on separate meetings of Expert Groups on Nuclear and conventional confidence building measures to be held in Islamabad in September this year. The Foreign Ministers talks have lived up to the expectations, as senior officials in New Delhi had said in the days before the ministers met that “Project Pakistan was no longer on life support, it has begun to breathe on its own.” The confidence building measures that were agreed upon are in line with the Indian government approach to take up “incremental, step-by-step” measures rather than build up euphoria and high expectations. And a courteous approach can help the process move a bit faster. This entry was posted in ISI, News. Bookmark the permalink.